Ever since the Floral City Furniture Company invented the first reclining porch chairs in the late 1920s, a recliner made in the USA has been a standard staple of home furnishings. The Floral City Furniture company, run by two cousins, was so successful that it began manufacturing reclining furniture almost exclusively. In 1931, they held a contest to name their famous chair--and while names like the Sit-N-Snooze and the Slack-Back were considered, they settled on the now famous La-Z-Boy moniker for which they are world-renowned. The rest, as they say, is history. Since those humble beginnings in Monroe, Michigan, the reclining chair and sofa have gained in popularity among homeowners. Soon, other companies in the United States began manufacturing recliners as well. The first footrest was added to a recliner made in the USA by the Barcalounger Company in Buffalo, New York in 1947. Pretty soon, furniture manufacturers all across America were inventing their own versions of the reclining chair, each unique and different from the patent acquired by the Floral City Furniture Company near the end of the roaring twenties. Barcalounger is still in the business and makes everything from reclining sofas to movie theater-style reclining chairs. Calabria imports genuine Italian leather and combines it with American craftsmanship, hand-making and stitching all of its classic leather recliners within the nation's borders. Diehard sports fans will be enamored with the recliner lines from DreamSeats, which creates team-themed recliners in top-grain leather and leatherette. There's an American company that makes a recliner for everyone. Recliners made in the USA are a part of the rich tradition mentioned above: The original recliner was made in the USA, and with jobs and products rapidly being outsourced to other nations, American-made recliners are a reminder of the quality and hard work that these first companies emphasized. The purchase of an American recliner ensures that American workers are paid decent daily wages and get to keep their jobs, which is beneficial for every US citizen. Moreover, buying a recliner made in the United States can allow for repairs or replacements to be obtained from a manufacturer more easily. Of course, the "Made in the USA" brand on furniture is still a mark of a quality piece of work, made in a country that treats factory employees and artisans alike with fair treatment and wages. Of course, buying American recliners also ensures a wide variety of companies and varieties of furniture to choose from. 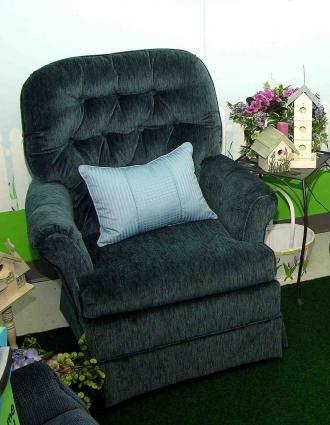 La-Z-Boy recliners are readily available throughout the country, with dozens of company owned stores and hundreds of independent furniture galleries to choose from. Even in a dwindling economy, La-Z-Boy grew 15 percent in the 2008-2009 fiscal year, underscoring the importance of their products to the American market. The Sofa Company of Los Angeles, California, not only allows customizable recliners to be built and purchased on their website, but they make a wide variety of accessories fitted to their Stressless recliners, such as swing trays, computer tables, and ottomans. Scherer's, one of the oldest furniture manufacturers in New York State, manufacturers recliners from many subsidiaries such as Colonial and Leisters-most with the "Made in the USA" seal. Berkline, Barcalounger, and dozens of other recliner manufacturers are still owned and operated in the United States, with wide offerings of furniture to suit every taste. With the United States' rich history of recliner manufacturing, high-quality products, American workmanship, and loungers that fit an array of budgets and tastes, American-made recliners still stand head and shoulders above many foreign brands. While searching for the right product might be a difficult task, these options usually make the purchase of an American recliner a good bet for the consumer.